I was in the neighborhood and thought a trip to Spot was long overdue. Unfortunately, I had already consumed 3 desserts by this time so I just ordered the smallest thing I could find. That turned out to be the mint chocolate cookie. I have had these cookies many times but just never wrote about them. Their texture is like that of a very flavorful brownie with a slightly crispy outer crust. Their main feature is a very strong mint flavor. One person, who I shared half my cookie with thought it was too minty, which I thought was ridiculous. Anyway, try one yourself and let me know. Spot’s website. Spot is located at 13 St Mark’s Place. 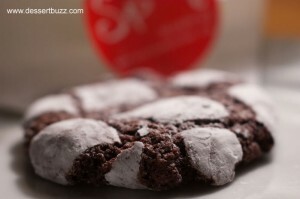 Mint chocolate cookies are my favorite…what I would give to have one of these right now! Dark chocolate is my favorite kind of chocolate. Chocolates have some natural antioxidants too.::. i love to eat dark chocolate because it is very tasty and it is full of antioxidants too~’.